Michael started his career with Northwestern Mutual-Chicago as a Financial Representative while attending Loyola University Chicago. While finishing his degree in Finance & Economics, Michael had the opportunity to grow his practice and learn the fundamentals of the financial security business. Upon graduating, Michael was excited to enter this career full-time. Since then, he has obtained new licenses and undergone continuous training to allow him to help his clients in a greater capacity and to keep his focus on what's truly important: helping his clients reach their goals over their lifetime. Michael has also had the opportunity to mentor, train and develop new College Representatives, serving as one of the College Unit Directors for Northwestern Mutual-Chicago, formerly the McTigue Financial Group. He then took on the role of Growth and Development Director, where he was able to continue his passion for mentoring others as he began to work with new full-time advisors. In 2017, Michael was named Managing Director. He leads a team of full-time financial advisors and currently spends about half of his time recruiting, mentoring and developing his team of advisors. As Northwestern Mutual – Chicago continues to build new client relationships and grow into new markets; it is adding to its leadership team. Michael Joseph Stahl, CLU®, a Financial Advisor, has been named Growth & Development Director with the Chicago-based financial planning office of Northwestern Mutual. As a Growth and Development Director, Mike takes on a leadership role attracting, selecting, developing and retaining a team of financial representatives. Through coaching and mentoring Mike will work with his team members to define a career path best for them. At the same time, he will continue to build relationships with his clients, helping them realize their most important financial goals. Since 2008, Stahl has been associated with Northwestern Mutual. He joined the firm as an intern while a student at Loyola University and converted to a full time financial representative upon graduation. Mike started to explore leadership opportunities in the company's Leadership through Education Achievement and Development (LEAD) program. As the first step in a development track he was appointed a College Unit Director where he led an energized group of college interns who are taking part in one of the top internship programs in the country, according to the Vault Guide to Top Internships, 1997-2016. A native of Champlin, Minnesota, Stahl received a Bachelor of Business Administration in Finance and Economics from Loyola University. He actively fundraises for Alex's Lemonade Stand Foundation and served on the Northwestern Mutual – Chicago Diversity and Inclusion Council. He resides in Wheaton. 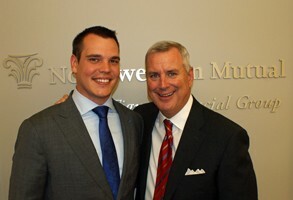 Northwestern Mutual has named Michael Stahl one of the Top 10 College Unit Directors for the 2013 Awards Year. Stahl is one of ten College Unit Directors across the country recognized as an outstanding performer for developing a strong team of college financial representatives. In addition to his day-to-day financial planning business, over the past two years Stahl served as a College Unit Director, leading a team that recruits on local college campuses drawing individuals of exceptional talent, drive and ability to the company's internship and career opportunities. “One of the cornerstones of the Northwestern Mutual internship is its commitment to developing young people,” noted John W. McTigue, Managing Partner. “In taking on a leadership role, Mike has welcomed an opportunity to make an even greater impact, and to stretch his personal and professional potential.” Many companies develop work through people. We pride ourselves on developing people through work, he added. Michael started his career in 2008 as a Financial Representative Intern while attending Loyola University Chicago. Upon graduation he entered the career full time. This year, The McTigue Financial Group hopes to recruit more than 50 college financial representatives to participate in the year-round internship program. On average 3 of 5 are offered a full time opportunity upon graduation.